It is easy to forget, after all the poor sequels and watered down extras that followed the first film, that Shrek is a true animated classic. When it first hit the screen, it was like nothing that had been seen before. Not so much the CGI animation but the style of story, the mix of pop culture references with classic fairytale tropes and of course the excellent voice cast which made the movie such a hit. Add to that the fact that it is very funny. From the beginning you realise it isn’t quite the fairytale kid’s film you’re expecting when Shrek interrupts the telling of a classic fairytale to then literally wipe his backside with the last page. This takes those classic ideas and throws them in a mix, creating something much more original and much better. 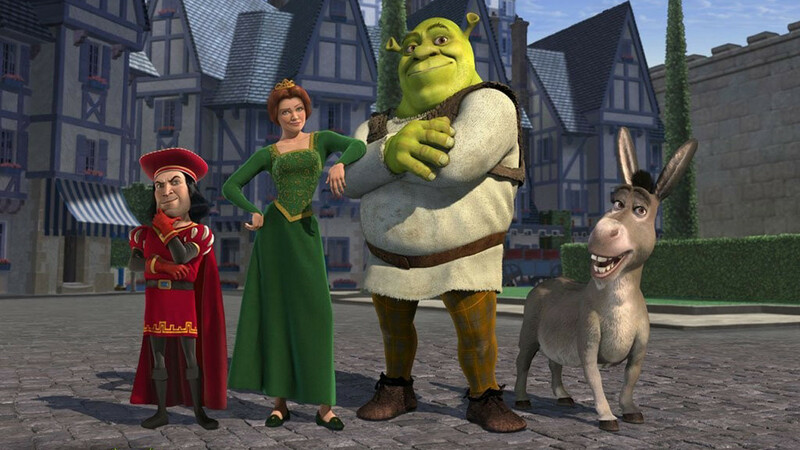 It is the reimagining of the classic fairy tales that makes Shrek so successful. The moment when the fairytale characters invade Shrek’s home, from the 3 Blind Mice to the Wolf from Red Riding Hood, you realise that you’re getting something else from your traditional fairytale. This theme continues, with the rebellious gingerbread man and game show host “magic mirror.” The scenes between the villain, Lord Farquaard and the Magic Mirror highlight how creative the writing is, turning choosing the perfect princess into a “blind date” style game show. This shake-up of the traditional fairytale ideas continues through to the hero of the story. Shrek is clearly not the handsome prince and his quest is a purely selfish one. When he first meets the princess he shakes her awake rather than the kiss she’s waiting for and the film is so much more refreshing for those kinds of touches. The relationship that then builds up between the two carries the rest of the film along to it’s very satisfying conclusion. It helps that the cast of the film bounce of each other perfectly. Mike Myers arguably delivers one of his best roles. His choice of the harsh Scottish accent to give Shrek the booming and intimidating voice is genius. It also helps when he has to be much more understanding and vulnerable, changing in an instant. Cameron Diaz brings Princess Fiona to life in a similar way and when the “twist” of the film occurs, the voice doesn’t waiver, adding to the character. The biggest success of the movie is of course Eddie Murphy’s Donkey. From the moment he speaks to the song-filled finale, Eddie Murphy brings the life and soul to the film. He has the best lines, the funniest sight gags and can’t help but bring a smile to your face with every moment he is on-screen. 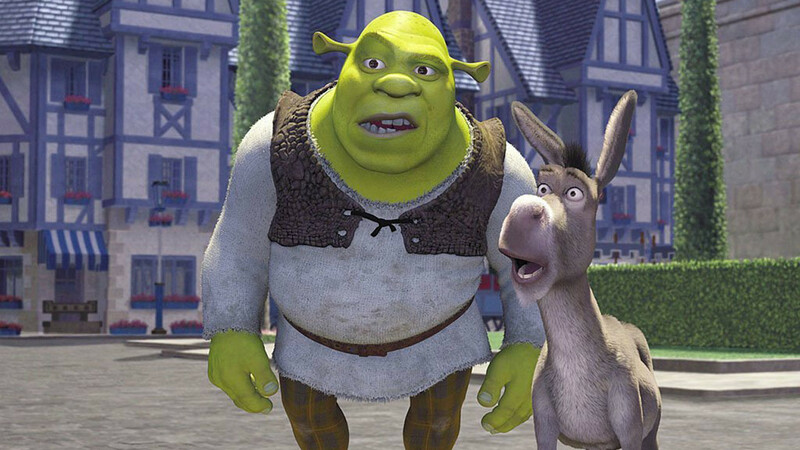 The budding “bromance” that emerges between Donkey and Shrek is up there with some of the best “buddy-cop” films. This is down to the great writing and way in which the character’s interact with each other. John Lithgow’s Lord Farquaart gets some great, villainous lines, eating up the scenery with every turn. Add to the great writing some well staged action sequences. The whole sequence where Shrek saves Fiona from the tower is a visually impressive, with fire, shadow, slow-motion and a killer soundtrack all contributing to a great set-piece. Like many kid’s films, there is an underlying message, Shrek’s being about acceptance and inner-beauty but unlike many, this doesn’t feel too laboured. It is very apparent and some may think the finale a little soft and soppy but I think it brings together the story perfectly, offering an unexpected and satisfying conclusion. Overall, time and sequels has dampened the memory of Shrek when Pixar’s classics are so fondly remembered. Going back to the film you will find some magic in the Ogre’s swamp, with a great story, impressive cast and a very unique way to handle a fairytale story. You’re right ,it’s nice to remember what it felt like to watch it for the first time.